Draft: 2013, Miami Marlins, 13th rd. Joshua Travis Riddle...in three years at the University of Kentucky, batted .283 with 28 doubles, three triples, nine home runs, 83 RBI and 16 stolen bases in 168 games…compiled a streak of 358.1 consecutive errorless innings from 2012-13 while making 121 consecutive starts at second base and shortstop…named Kentucky High School Mr. Baseball in 2010 after leading Western Hills (KY) High School to its first district title in 15 years. Season debut delayed due to stint on disabled list for right shoulder tendinitis...Placed on DL on March 29; following four-game rehab assignment at Jupiter and Jacksonville (two games each), was recalled from rehab and assigned to Triple-A New Orleans...Made season debut on April 30 vs. Round Rock and went 3x4 with a double, home run, and two RBI..Batted .346 (28x81) in 21 games for Baby Cakes... Had six-game streak of multi-hit games from May 4-10; went 15x29 (.517) with two doubles, a triple, a home run, and 11 RBI, which included multi-RBI outings in first three games ..Recalled from New Orleans on May 26 and went 0x8 in first three games before going five-game hitting streak from May 29-June 2..Had season-long six-game hitting streaks from July 3-10 and August 17-23...Hit 19th inside-the-park homer in Club history on May 29 at San Diego; first of his career and first by a Marlin since J.T. Realmuto on August 25, 2017...Tied career high with three hits four times (June 28 vs. Arizona; July 4 vs. Tampa; July 8 and August 18, both at Washington)...Tied career high with four RBI on August 18 at Washington...Hit first career pinch-hit homer on August 22 vs. the Yankees...Set career highs with 102 games, 71 hits, nine homers, and 36 RBI...Hit final home run of season on September 11 at the Mets; had not played since Sept. 3 vs. Philadelphia due to left wrist soreness. 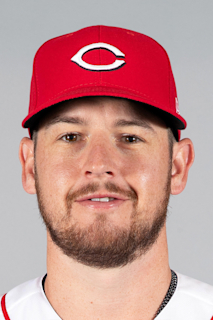 Began season with Triple-A New Orleans; appeared in three games (6x14) before being recalled on April 9 and making MLB debut on April 11 vs. Atlanta (0x4)...Recorded first career hit in second game (April 12 vs. Atlanta)...First career home run was walk-off two-run home run on April 16 vs. New York-NL, becoming third in Club history to do so (also, Robert Andino and Miguel Cabrera)...Optioned to New Orleans on April 19 and recalled on May 8...Placed on 10-day disabled list with left biceps tendinitis on July 25, ending his season...Overall, appeared in 70 games with Miami over two stints, batting .250 (57x228) with 13 doubles, a triple, three home runs, 31 RBI...Opened career 2x21 (.095) in first 13 games...Had a hit in 37 of final 57 games played, batting .266 (55x207) ...Put together eight-game hitting streak from July 2-9, batting .419 (13x31) with two doubles and six RBI...Ranked 18th in hits (57) and 15th in RBI (31) and multi-hit games (16) among National League rookies...Was 16x51 (.314) with 26 RBI with runners in scoring position; average ranked third among NL rookies (min. 50 plate appearances). Played primarily for Double-A Jacksonville (101 games) before joining Triple-A New Orleans for final 15 games of season...Set career highs in games played (116), hits (123), doubles (20), and walks (34); tied career high in triples (four)...Batted a combined .276 (123x445), good for third among qualified Marlins' minor leaguers...Produced career-best 25-game hitting streak (.370/37x100) from June 23-August 6, longest streak in Southern League in 2016...Reached base a season-high five times on July 8 at Biloxi, going 4x4 with a walk, an RBI, and two runs scored...Hit a season-high .444 (24x54) in 14 July games, with six doubles, a home run, five RBI, and 12 runs scored...Was on seven-day disabled list (left hamstring strain) from July 10-26...Named Southern League Postseason All-Star after batting .338 (44x130) with eight doubles, a triple, a home run, 15 RBI, and three stolen bases in 34 second-half games before being promoted August 18 to Triple-A New Orleans...Had a 10-game hitting streak (.342/13x38) from August 20-31 and hit safely in 11 of first 12 games with NOLA (.326/15x46). April 16, 2019 Miami Marlins optioned SS JT Riddle to New Orleans Baby Cakes. May 26, 2018 Miami Marlins recalled SS JT Riddle from New Orleans Baby Cakes. May 2, 2018 Miami Marlins optioned SS JT Riddle to New Orleans Baby Cakes. April 30, 2018 Miami Marlins sent SS JT Riddle on a rehab assignment to New Orleans Baby Cakes. April 26, 2018 Miami Marlins sent SS JT Riddle on a rehab assignment to Jacksonville Jumbo Shrimp. April 23, 2018 Miami Marlins sent SS JT Riddle on a rehab assignment to Jupiter Hammerheads. March 29, 2018 Miami Marlins placed SS JT Riddle on the 10-day disabled list retroactive to March 26, 2018. Right shoulder tendinitis. October 2, 2017 Miami Marlins activated SS JT Riddle from the 10-day disabled list. July 25, 2017 Miami Marlins placed SS JT Riddle on the 10-day disabled list retroactive to July 22, 2017. Left biceps tendinitis. May 8, 2017 Miami Marlins recalled SS JT Riddle from New Orleans Baby Cakes. April 20, 2017 Miami Marlins optioned SS J.T. Riddle to New Orleans Baby Cakes. April 9, 2017 Miami Marlins recalled J.T. Riddle from New Orleans Baby Cakes. March 17, 2017 Miami Marlins optioned SS J.T. Riddle to New Orleans Baby Cakes. November 18, 2016 Miami Marlins selected the contract of J.T. Riddle from New Orleans Baby Cakes. August 18, 2016 SS J.T. Riddle assigned to New Orleans Zephyrs from Jacksonville Suns. July 26, 2016 Jacksonville Suns activated 3B J.T. Riddle from the 7-day disabled list. July 11, 2016 Jacksonville Suns placed 3B J.T. Riddle on the 7-day disabled list retroactive to July 10, 2016. January 14, 2016 Miami Marlins invited non-roster 3B J.T. Riddle to spring training. September 8, 2015 Jacksonville Suns activated 3B J.T. Riddle from the 7-day disabled list. August 5, 2015 3B J.T. Riddle assigned to Jacksonville Suns from New Orleans Zephyrs. August 4, 2015 3B J.T. Riddle assigned to New Orleans Zephyrs from Jacksonville Suns. June 27, 2015 3B J.T. Riddle assigned to Jacksonville Suns from Jupiter Hammerheads. June 22, 2015 Jupiter Hammerheads activated 3B J.T. Riddle from the 7-day disabled list. May 26, 2015 Jupiter Hammerheads placed 3B J.T. Riddle on the 7-day disabled list retroactive to May 24, 2015. April 6, 2015 3B J.T. Riddle assigned to Jupiter Hammerheads from Greensboro Grasshoppers. March 17, 2015 3B J.T. Riddle assigned to Miami Marlins. May 10, 2014 Greensboro Grasshoppers activated 3B J.T. Riddle from the 7-day disabled list. March 31, 2014 3B J.T. Riddle assigned to Greensboro Grasshoppers from Batavia Muckdogs. March 14, 2014 3B J.T. Riddle assigned to Miami Marlins. June 17, 2013 3B J.T. Riddle assigned to Batavia Muckdogs. June 16, 2013 Miami Marlins signed SS J.T. Riddle.